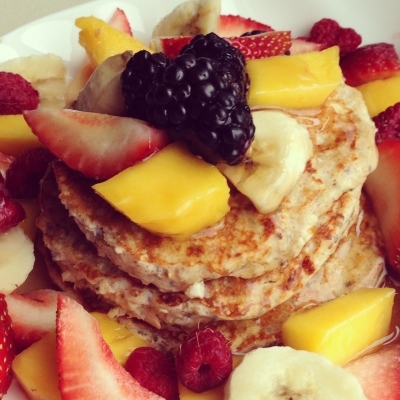 The perfect Sunday morning breakfast! Combine oats, egg whites, yogurt, 1/2 banana, chia seeds, ground flax, and cinnamon. Heat pan on medium, melt coconut oil, then scoop 1/3 cup portions of batter onto pan. Once bottom is golden brown flip and cook a few more mins. Top with 1/2 sliced banana, strawberries, mango, blackberries, raspberries and sugar-free syrup.